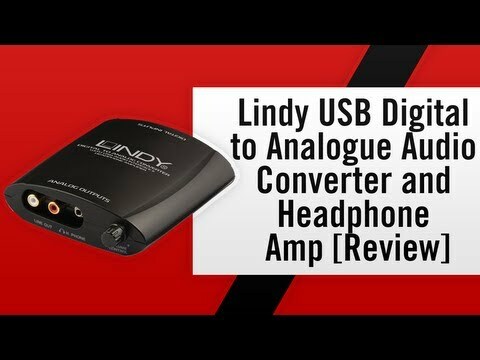 The Lindy USB Digital to Analogue Converter with Headphone Amplifier is a superior quality DAC that converts and enhances digital audio signals to analogue stereo audio, for a high-resolution listening experience of your movies, games and music. Featuring optical, digital coaxial and USB-B inputs, and L/R analogue outputs, this converter is a premium DAC that not only converts digital audio signals seamlessly but also eliminates interference and improves sound quality from the source device, perfect for use with devices such as PS4/XBOX One, Smartphones, PCs and other audio devices with no loss in audio quality for a superior 2-channel audio experience that enhances the impact of video or audio content. With an in-built headphone amplifier, this converter also provides high quality audio via headphones, boosting the volume of music or videos, especially useful for higher impedance headphones above 32Ω. With additional support for a lossless hi-res sampling frequency of 24 bit/192KHz, music and movies can be heard exactly how the artist and sound engineers intended, with greater detail and clarity. The converters input selector switch, allowing the input signal to be easily changed, and headphone volume dial also provides simple control for both home users and professional installers, while the DAC’s ‘Plug and Play’ functionality ensures fuss-free connectivity within an audio ecosystem. View a 5 star YouTube review video for this product here. I purchased the Lindy USB DAC and Headphone amp, the product arrived next day using first class post. I needed a Digital audio to 3.5mm headphone socket converter to connect a small television into a motorhome audio system. This converter works really well, high sound quality, and is conveniently powered from the USB socket on the television, so no additional power supply ! Review Summary: USB Digital to Analogue Converter with Headphone Amplifier 5.00 out of 5 based on 1 ratings.